Pink (H8) flowers, VI–IX, split into segments; grey-green foliage; height 10–15cm; spread 31–45cm. Wild-collected; found near Newark, Nottinghamshire, England, by D. Lockie (Taunton, Somerset) in 1974; introduced by C. G. Hollett (Sedburgh, Cumbria). Lilac-pink (H11) flowers, VI–X, usually split into curled segment; grey-green foliage; low neat habit; height 10–15cm; spread 31–45cm. 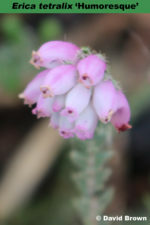 Wild-collected; found on the moors in Dorset, England, by C. D. Eason of Maxwell & Beale's Nursery (Broadstone, Dorset); introduced by Maxwell & Beale in 1936. Named by Charles D. Eason after his daughter (Yearbook of the Heather Society 4 (1): 33 (1993)). However it is also said that no-one is commemorated and that these were D. F. Maxwell's two favourite girls' names (Yearbook of The Heather Society 1971: 27).